Information: This color image of North East Africa and Arabia was taken from an altitude of about 500,000 kilometers (300,000 miles) by the Galileo spacecraft on December 9, 1992, as it left the Earth en route to Jupiter. 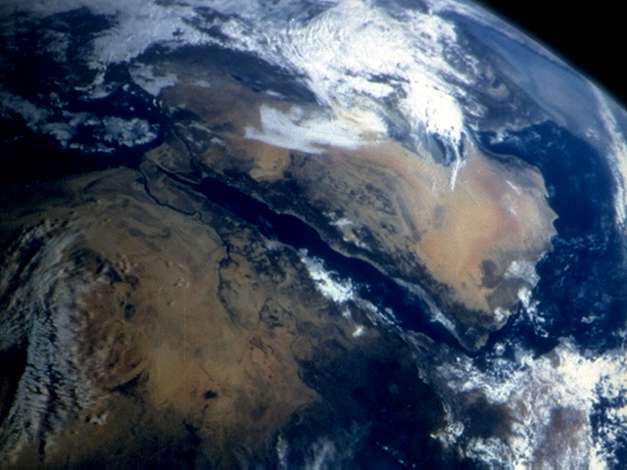 Mot of Egypt (center left) including the Nile Valley, the Red Sea (slightly above center), Israel, Jordan and the Arabian peninsula are cloud-free. In the center, below the cloud on the coast, is Khartoum, at the confluence of the Blue Nile and the White Nile. Somalia (lower right) is partly cloud covered.